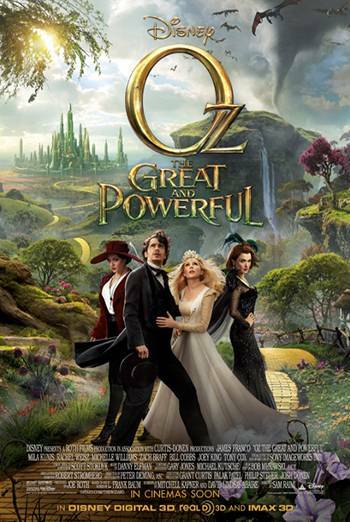 OZ THE GREAT AND POWERFUL is a fantasy adventure telling the story of the Wizard of Oz's arrival in Oz. During Oz's adventure, the basket of his hot-air balloon is pierced by fence-posts during a tornado, he is chased by flying baboons, and he is snapped at by man-eating plants. However, the threat is not intense and the sequences are over quickly, with Oz and his companions emerging unharmed. One of the witch characters has scars etched onto her cheeks when she cries and another is turned into an old hag when her powers are removed; there is no gory detail in these transformations. Another character, a small doll made of china, carries a knife but it is quickly taken off her by the hero and thrown away. The film contains only very mild bad language (e.g. 'damn').